Since May 2018, I have been working on developing a training in low-energy construction targeted at builders & contractors. We have all known for a while that there is a very large gap in skills in this area within the building industry, and at the same time there is almost no training in the UK to meet the need. So with the launch of this training, I hope that this is going to change! To get this training together, I have teamed up with CarbonLite, a group of trainers linked to the AECB that already run Passivhaus training for designers/architects. They had had the same vision/idea as me at the same time, so it made sense to work together. And since I had set aside time for this over the summer, it worked out that I ended up taking responsibility for most of the material development to push this forward. This is now done and the training is ready to be rolled out. Our first attempt at this training will be at the end of October in Manchester – and as of yesterday the website is working and we can take bookings. The idea thereafter is to run them regularly, and have the ability to run them anywhere in the country. This is a training for anyone (builder, self-builder, architect) who has an interest in getting their head around low-energy building techniques. While it follows the principles of Passivhaus, which is all about fabric efficiency, it’s not only for those building to Passivhaus level – rather the principles apply to different levels of energy efficiency. The main course takes 2 days and includes both theory and practice (practicals around installing insulation and airtightness). 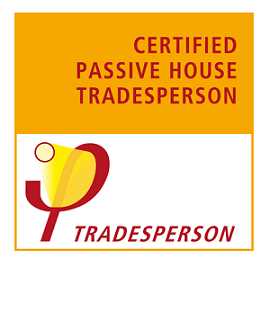 For those people that want it, there is an option to attend subsequent revision/exam sessions in order to get certified as a Passivhaus Tradesperson. Dates will be 29-30 October for the main course. The optional revision session/exam will be on 9 & 17 November for those wanting certification. Venue to be determined but will be in the Manchester area. The website for booking the Passivhaus Tradesperson course is at last functional – click here for info. Price for the next 10 days will be £200+VAT for the 2-day course if you’re a member of the AECB (if not then membership is encouraged for £50+VAT annually) – then to get certified requires an additional revision and exam session a £375+VAT.